VIP Parking and seating tickets are optional. General Admission and General Parking is free! In order to keep our Airshow patrons and the base community safe, Marine Corps Air Station Yuma have implemented a safety policy that limits the size and type of bags that may be brought to the Yuma Airshow. 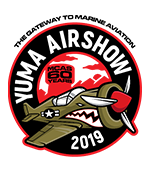 The Yuma Airshow strongly recommends that Airshow patrons implement these security measures to help enhance public safety and make it easier for our Military Police team to screen and check all bags, backpacks, and more. With respect to others, we are encouraging patrons to not bring any unauthorized items (outlined under "Prohibited Items"). This will help keep the entry lines continuously flowing upon your arrival to the Yuma Airshow and any hindrances will create congestion at the front gates. The Yuma Airshow wants to make sure that every patron is able to enjoy and have a unique airshow experience. We thank you for helping us make it easier for everyone else. We ask for your cooperation in keeping potentially dangerous items safely outside the base. ALL bags will be quickly inspected and all individuals are subject to search priot to entering the airshow flight line. If you elect not to return these items to your vehicle and choose to leave them at the security check point, we will not be responsible for the return of the item. These measures are being taken to ensure everyone's safety. Pay Attention - Watch where you are walking. Trip hazards are everywhere. Stay aware of your surroundings and watch for moving vehicles. Drink Water - Stay hydrated. Water will be available throughout the airshow area. Refreshments are normally available, but you may bring a water bottle to fill from our free water stations. If you are drinking alcohol, please drink in moderation as alcohol can cause dehydration. Do not rely on sugary drinks for hydration. Plan for Noise - Jets can make a lot of noise so we strongly suggest you bring earplugs or ear protection, especially for little ones. Plan Ahead - Do fine out where you can get medical aid or seek assistance if you need it. If you are in a group and you get separated, where will you meet? If you have children with you, make sure they know how to get help if they get lost. Q: Once on base, do I have to remain there until 3PM? A: You are free to come and go between the scheduled airshow times. Please not that there will be heavy traffic to come aboard MCAS Yuma on airshow day. Q: Are there activities for kids? A: Yes, there will be a fun zone for the kids and many sponsors will have interactive booths in the Vendor Village. A: Yes, there will be several water stations available throughout the event. We recommend you bring an empty bottle to fill up. Q: In an emergency, where do we do? Q: Do I have to purchase a parking pass if I am handicapped? Q: Will I be able to access the base if I do not have a US license plate or license? A: Yes, as long as your vehicle is currently registered and insured. Vehicle may be subject to search. For the Twilight Show, however, you must also have one of the limited parking passes available to access the base on March 8th, 2019. Q: Can I drive my RV onto the base? A: No, unfortunately, due to space and parking locations. MCAS Yuma cannot accommodate Recreational Vehicles.